An English Homestead: First Tomato Of The Season! The first tomato is ripe in the greenhouse! It's a Bolivian Orange Cherry, grown from seed that I got from the Herefordshire seed swap. As for how it tastes - I think I better let the girls have this first one! Who else has tomatoes ready? All ours are outside, no greenhouse, sniff:( Not a single fruit yet. Oh, I wish! I'm at LEAST a month away from that joy. 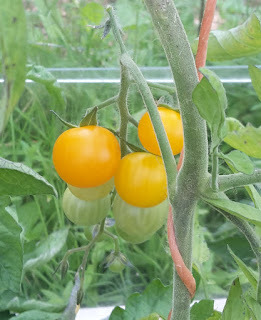 Lots of sunshine here to ripen the tomatoes, but our tomatoes are still too small! That's so exciting! We have some tomatoes on the plants here but they are still small and green. I've never heard of that variety - is it an heirloom type? They're very pretty. i picked my first tomato and instead of eating it, i added it to a dish for my son and his fiance. later in the day i was in their garden and saw that they had 6 very red tomatoes some of which had split. i texted them and asked them why they hadn't been eating their tomatoes and they told me they didn't know when to pick them. this is the first time they've had a garden. i guess they have to start somewhere! teehee. i just went out and found my first 2 tiny-tiny green tomatoes. all of the tomatoe plants are flowering nicely so we expect a good harvest. but your stuff sure does ripen alot faster over there than over here. let us know what the girls thought of their tomatoes! I just posted about our first tomato of the season, it was from two weeks ago (though I just posted about it, ha) and now I was out at the farm this weekend and we have a LOT now! One leads to two and two leads to dozen, LOL! Enjoy! I'm eating our first yellow cherry toms. Lovely.